Twenty five recipes, a week’s worth of prep, and 50€ lighter in the wallet. All of it, mind you, for a lunch that barely lasted 45 minutes. How is it possible to go through a pile of food and not suffer the ill effects of massive indigestion later on? I’ll tell you how. 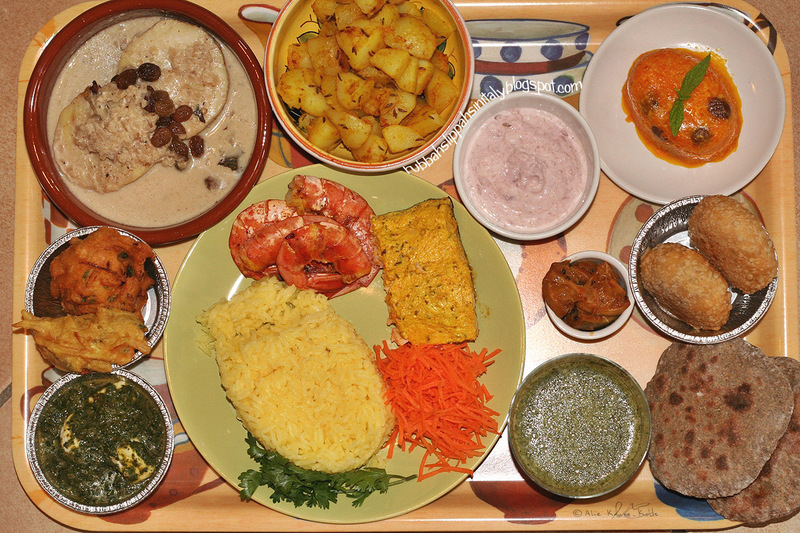 Thali. Thali is a foodie’s dream in a land of plenty-on-a-plate. Addressing the real deal would be folly for picky eaters. A large platter carries the burden of this feast, where an array of small bowls filled with savory scents, colors and textures are set before the diner. I learned about thali on youtube and immediately knew that this woud be the next big cookfest. Come north or south, the videos detail a long list of dishes that presented a challenge. It’s thalis or bust! Out of the six chapati that I made only 2 puffed up. Traditionally the platters and bowls used to serve thali are made of steel, but huge banana leaves also make an appearance in southern thalis where the meal’s components are placed on the leaf. Everything is eaten with your hands – no western cutlery – which makes for an awkward balancing act between fingers and food before deftly placing it into your mouth. This was not easy, and after a couple of attempts we had to break out the forks. All of what you see here was an amazing foray into the pleasures of indian food. The cuisine has always intimidated me because of the unfamiliar ingredients. What’s aamchur powder? Horse gram? It was impossible to get a few of them, so substitutions were made as needed. The surprising thing was that neither of us felt uncomfortably full after the end of the meal. Given the small portions, it was like grazing on apps during happy hour. There was just so much of it that I don’t regret not being able to make mango lassi. Clockwise from bottom left corner: palak paneer, onion pakora, mughlai fish korma, jeera potatoes, red onion raita, carrot halwa, dal kachori, lime pickle (left of dal kachori), five flour chapati, mint chutney, on plate – saffron pilau rice, bombay shrimp masala, tandoori salmon and grated carrots. View at full 1200×800 pixels. Palak paneer – be sure to heed Indira’s advice in getting the consistency of this spinach and paneer dish right. I made my own paneer cheese…only 2 ingredients…and there are dozens of identical recipes on the net. Onion pakora – I ♥ these!!! Kamran made me rethink my ‘no fried foods’ restriction, and I am happy to say that they now rank #1 to my other fried weakness – french fries. Mughlai fish korma – Nigella Lawson’s recipe is actually for chicken but as I wanted fish, hake medallions took its place. Good, but I wouldn’t make this again. Jeera potatoes – quick and easy! Red Onion Raita – make that roasted red onion. I made this 3 days ahead of time and the flavor developed nicely. Carrot halwa – I’m not even that wild about carrot cake but this was hard to put down. Dal kachori – the first at the frying station. I was only able to find green moong dal but they still turned out delicious. Take note of Athika’s tip on the desired end result. Lime pickle – making these the proper way involves a lengthy process that goes beyond what I was willing to do so I followed this quick recipe. The MotH eats them like candy. Five flour chapati – unable to find 3 out of the 5 flours listed, my version uses whole wheat, millet, garbanzo, chestnut, and amaranth flour. I cut the recipe in half and made 6 chapati of which only 2 puffed up like a pillow (1st image in this post). These take skill! Mint chutney – I love mint, and would dip anything in this stuff. Sushi included. Saffron pilau rice – I should’ve added more saffron for a deeper yellow color like Natasha’s. Bombay shrimp masala – the recipe applies to fish but it works great with shrimp too. 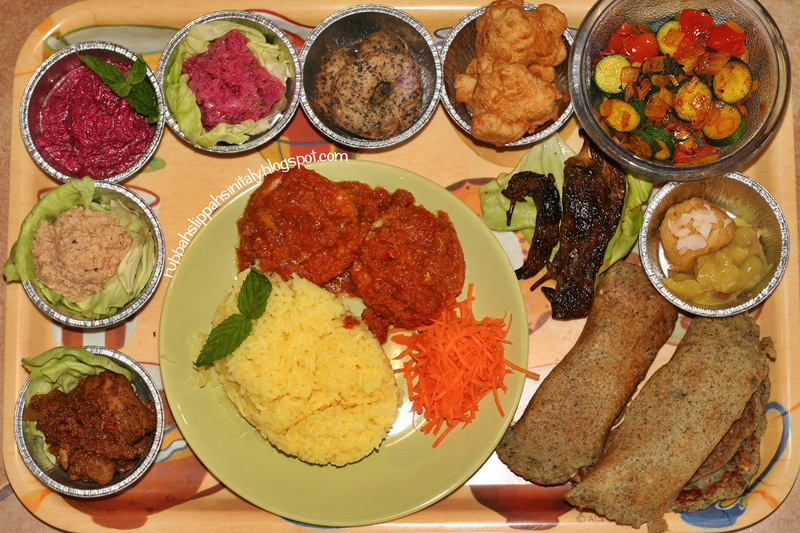 Clockwise from bottom left corner: chettinad chicken kari, peanut chutney, beetroot pachadi, onion chutney, medhu vadai, mysore bonda, zucchini version of vendaikkaai poriyal, ladoo and badam halwa (together), fried buttermilk chilli (left of laddo), paruppu dosai, on plate – saffron rice, masala fish, grated carrots. Chettinad chicken kari – a chance to use the packet of fenugreek seeds. Great dish! Peanut chutney – should’ve made this a little more watery to dip the mysore bonda in. Beetroot pachadi – made 3 days ahead of time. Onion chutney – the recipe calls for tamarind which I didn’t have so I used lemon juice. Medhu vadai – I had no idea that the urad dal called for in this dish was supposed to be the split, dehusked ones. I had the whole black urad dal which gave the batter tiny dark specks. Mysore bonda – I had a lot of things going on at once and opted to use a #40 scooper instead of shaping these with my bare hands. Wish I could’ve found mango pickle to serve it with. Ladoo – these are diet taboos for sure. Butter, sugar and the nutty flavor of garbanzo flour all in a couple of bites. I topped them with coconut flakes instead of pistachio. Addicting. Fried buttermilk chilli – I started these a week in advance because they take that long to prepare! We don’t have small, pale green hot peppers so I used the bigger and deep green hot peppers commonly found in italian markets. That’s why mine are so dark. I burnt my lips on the first bite. Paruppu dosai – a variety of paruppu (dal) and brown rice are ground together for this, but I needed to substitute the toor and masoor dal, horse gram (a type of bean) and asfoetida (an herb seasoning). I added more split peas, moong and urad dal to the rice. For the asfoetida, garlic powder is the next best thing. Masala fish – this is supposed to be a fried fish but the marinade looked too good to not dump all of it into a pan along with the hake medallions. Btw, I used frozen hake and they were okay at best. Next time only fresh fish in indian recipes. This entry was posted in indian cuisine and tagged vegetarian on June 22, 2011 by Rowena.